Hamilton's Seanymph Boats has enjoyed a resurgence in recent months and is prepared to look outside the production norm, as witnessed with the release of the new Seanymph Stargazer. Seanymph's Robbie Hopper is a sailor at heart. Despite building fibreglass runabouts for a living, sailing is Hopper's passion and most weekends you'll find him racing model yachts at his local Hamilton Lake. And he's not bad at it either, picking up his share of wins. It should come as little surprise, therefore, to find sailing craft on Hopper's build inventory. The first small yacht off the Seanymph line is the 2.8m Seanymph Stargazer, an all-purpose sail trainer pitched at school-aged children. The Stargazer is not a performance orientated planning dinghy in so much as it is a stiff and wholesome boat designed to carry its sail in a blow. It has full sections, high topsides and a noticeable chine aft - features that make it easily handled and safe, but not a downwind flyer. That is not to say it is not capable of lifting onto the plane. It is, but it will take quite a blow. The Stargazer is constructed of solid GRP with generous buoyancy chambers built into the seats and forepeak area to ensure it floats high and dry when capsized. The dingy carries an un-stayed two-piece kitset mast that drops into the centreboard casing and is secured with a pin. The mast is available in both anodised aluminium and carbon fibre. The boat is supplied with two sail options - a 4sqm mainsail for sail training and a larger 6sqm sail for performance sailing. The Stargazer is well finished with a solid teak gunnel, varnished timber centreboard and rudder and Ronstan fittings. It is delivered on a road trailer with covers and gear bags. The Stargazer is simple to rig and easy to sail, with only a mainsheet and boom vang to operate. The sail slides over the mast and is lashed to the gooseneck. Outhaul tension is set before leaving the beach. The boom, available in carbon fibre or aluminium, is at a sensible height and, while still capable of bruising your grey matter, does not require sailors to tie themselves in knots when gybing or going-about. 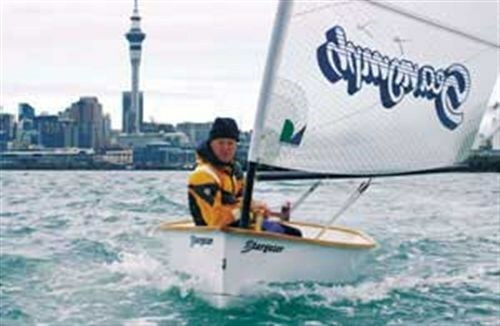 Hopper says the idea behind the Stargazer is to introduce a new class into intermediate and secondary schools in the hope that more Kiwi kids experience at a young age the joy of sailing. 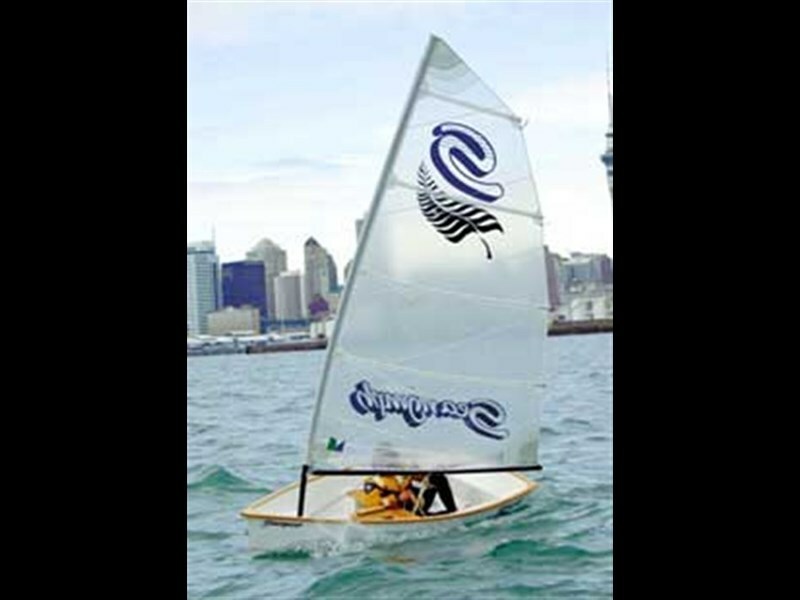 By producing a solid, low-maintenance and easily managed sailing dinghy, Hopper hopes schools will avail themselves to keen pricing and interest-free terms, thus creating a sizable fleet and an active inter-schools racing program. 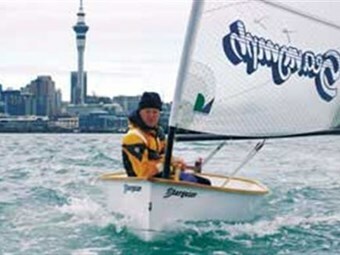 He says many of New Zealand's sail training dinghies are more than a handful for young sailors and believes the Stargazer will fill a gap at the beginner-end of the dinghy market. Time will tell. To my mind the Stargazer fits the bill for a dinghy capable of carrying an adult tutor and a young trainee. Too often, kids get thrown into dinghies on their own and pushed off the beach to sort things out for themselves. I remember the experience at age seven and was so terrified by the ordeal that it was three years later before I sailed again. Hopper has already sold four boats; two to grandparents keen to teach their grandchildren to sail while enjoying the experience themselves. The other two have been sold as tenders. It is this market that the Stargazer is likely to find its biggest market. While at 58kg the Stargazer is perhaps too heavy to be a sensible tender for small keelers and launches, it is equipped with an outboard mounting bracket and tows sweetly behind larger craft. The dinghy is equipped with a timber outboard bracket and will carry anything up to a 5hp outboard. So, how does it sail? Considering I'm not as fit or light as I once was, the Stargazer performed admirably in a 12 to 15 knot breeze on Auckland's inner-harbour. I was impressed with the dryness of the boat, the little chine keeping the water on the outside of the boat where it belongs. I was too heavy for the boat in the wind strength and got nowhere near to planing off the wind, but covered the miles surprisingly well. The dinghy is predictable, easily managed and quite comfortable. The Mylar sail took a little adjusting on the outhaul and vang to get the woollies working in unison but once trimmed properly the boat sailed well. The Stargazer was fitted with a carbon fibre mast and boom and was, for my weight, far too bendy. I would opt for a stiffer aluminium section. The boat is fitted with stacking straps, but even in the gusts these were surplus to requirements. In a nutshell the Stargazer sails nicely, but it is not what I would call exhilarating. But put a kid in it and the whole equation would change. The dinghy's real strengths lie in its multi-purpose function as a safe and stable sailing dinghy while doubling as a tender for mid-size launches and yachts. Its kitset spars and road trailer also make it ideal for towing to the lake or beach during the summer months and storing under then house over winter. If this sounds like your sort of sailing then contact Robbie direct who will be more than happy to arrange a demonstration. Sea nymph Boats Ltd, PO Box 20500, Hamilton. Tel (07) 847 7005 0274 772 222.